To discuss what is "normal" for rotatory chairs, we have to first decide on the parameters of interest. There are many possible ways to spin people around, and due to this, many potential "norms". System theory says that for a "linear" system, one can represent it as a single "pole", and all of these stimuli should produce the same answers and be interconvertable. It is thought that the vestibular system is linear for low velocities which usually also means low accelerations, but the linearity assumptom is violated at higher velocities. Or in other words, for 30 deg/sec, both steps and sines should give pretty much the same answer. For 300 deg/sec, things could look pretty different due to nonlinearity. While both the sinusoidal and step responses are very predictable, meaning that people can "suppress" their responses, practically most commercial vestibular testing uses the simpler and less demanding predictable stimuli. By less demanding, we mean that the equipment needed to produce these stimuli can have less torque (power) than that needed to produce predictable stimuli. This tranlates into a more economical device. Imagine for example, that we decided to mix together 5 different sine waves, each one of which that had a maximum acceleration of 100 deg/sec/sec. It would be possible for the sum of these sinewaves to occasionally produce a sine wave that needed 500 deg/sec/sec. Similarly, if each sine had a peak velocity of 60 deg/sec, one could end up with a peak velocity at some point of 300 deg/sec. This is beyond the capability of most commercial rotatory chair devices. Thus it is not important to provide much discussion about SOS or PRBS, as almost nobody uses these protocols. One might ask then-- why test with both sinusoids and steps, if they are interconvertable ? Basically for redundancy -- when doing something important, it is always a good idea to have two different methods of finding the same answer. I recall in my training, I was talking to Dr. David Robinson (an engineer) about mathematical proofs. Dave told me: Suppose you are building a bridge. Your calculations should also be done two different ways, and you should get the same answer both ways. Normal rotational chair test. Gain and phase are mainly within normal limits suggested by the manufacturor (Micromedical here). So what we have here is a matrix of three outputs from the sinusoidal test, as a function of frequency. The test above then has a total of 7 frequencies*3 values -- 21 numbers. Thats a lot of numbers ! While one can reasonably cut the number of frequencies down to just 4, and also reasonably ignore the asymmetry value, still we have 8 measurements to deal with. To make things more interesting (?) the frequencies chosen by various authors are not always standardized. In studies that use sum of sines, the frequencies chosen cannot be multiples of each other, as they they would not produce a random stimulus. Instead of going from 0.1 to 0.64, an example might be the study of Peterka et al (1990) where frequencies ranged from 0.0092 to 1.535. Ahmed (2014) published a useful set of norms in the Med J Cairo Univ. This article, though not indexed in PubMed, contains the results of testing 100 normal subjects on the Micromedical system 2000 (A commonly used commercial rotatory chair). The age range was 18-56, and there were 66 males and 34 females. Also plotted are the results of Li et al, who studied 41 normal subjects in a similar way, using the Congravez-Goerz model 403D chair. In this study, the higher frequencies were not used (Li et al, 1991). 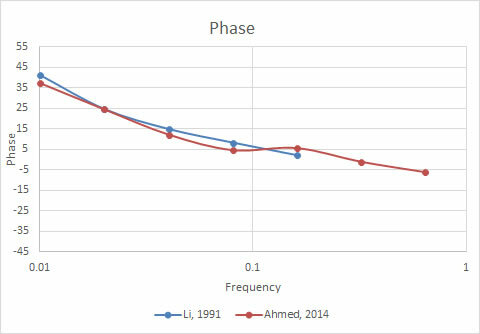 Note that phase values are almost identical, but gain is noticiably higher for the Li study (done with the Contravez chair), than for the Ahmed study (done with the Micromedical chair). We do NOT think that setting "norms" for every single frequency is a very useful undertaking, as summary values such as the high-frequency gain and the time constant are far more useful. Still, it is place to start. 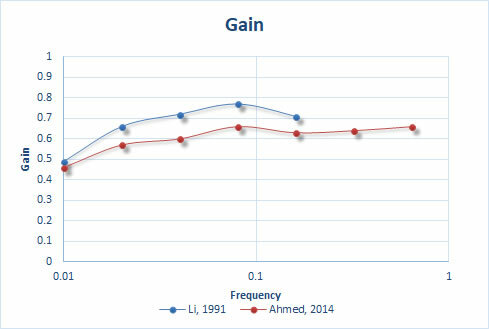 Note that the phase values of Ahmed have been multipled by -1 to make them comparable with other studies. The wiggles in these numbers are probably in part artifact or noise. Gain should rise smoothly with frequency. The dip at 0.16 is probably due to noise. Phase should never cross 0, and thus the last value at -5.99 is probably noise as well. As frequency goes up, there is more opportunity for technical error -- the chair might not be able to deliver enough torque, and the goggles might slip on the head. Commentary about how to convert from Phase to Tc is found below. Peterka et al (1990) provided norms for SOS in 207 subjects (across a large age range). The average gain was 0.72 and TC was 24.5. This is much longer than gains and TC computed below from steps, and also somewhat longer than the single sine values reported above from Ahmed, 2014. Baloh et al (1979) 0.62 18.20 128 deg/sec rotation, data was fit to both Tc and Ta. Fitting for Ta makes Tc larger. Dellepiane et al, 2006 0.42 7.7 20 This is clearly an outlier. 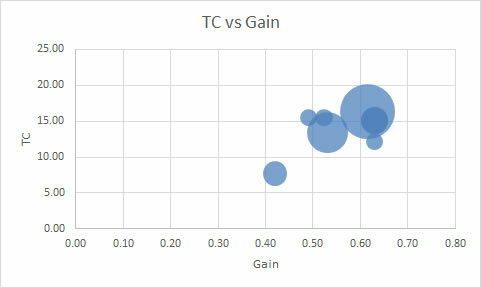 A simple average of the gains and Tc above provides a value of 0.56 and 14.25 for Gain and TC respectively. Figure 3: Literature values for TC/Gains in normal subjects, a bubble chart of data from table 2. The studies with. largest 'n's are the largest bubbles. Different speeds. Higher speeds result in lower time constants. We think a reasonable speed is somewhere between 60 and 100. Different methodology of extracting the time constant -- Baloh et al (1979) fit both Tc and Ta. Fitting Ta makes Tc longer. Wade et al (1999) provided norms for PRBS/SOS combined, and reported on 743 subjects with 0-20% caloric paresis. There was a total of 1115 patients studied with PRBS at one site, and 210 with SOS at another. Of course, combining these two groups of patients tested with different protocols assumes that these methods produce the same results. Still, 80% of these patients were from the PRBS site. The average gain was 0.65, and TC was 16.0. This is very close to the average above, abeit the gain is a little higher. Here the accelleration was only 20 dec/sec**2, and the speed was 50 deg/sec. This keeps things in the linear range (which is good). As shown in the table 1 above (Ahmed), one can convert back and forth between the timing numbers (i.e. phase and Tc) for sinusoidal and step responses. If you convert phases in the gain/phase table into time constants, for the lowest 4 frequencies, the numbers are as noted above. Note that the values computed from the sinusoids is not equivalent to the step response time constant, but rather is a little higher. The most reliable is likely the lowest frequency as the phase shift is the largest and thus the most measurable. One potential explanation is that the velocity is higher for the step responses (100 deg/sec), as time constants go down with speed. This is probably part of it. Another is that the step responses may be more vulnerable to adaptation. One would expect that the post-rotatory responses would last longer (because they have the adaptation from the per-rotatory to help them). In both Ahmed's data and the manufacturer's data, the post-rotatory Tc is indeed about 0.8 sec longer. This idea could be checked with a simulation. There is also an issue in that some computations for step responses use a 2-pole fit (i.e. including adaptation), and others don't. One would expect that the two-pole fits would have a longer Tc. A third explanation is that the time constant for a step response is also affected by spontaneous nystagmus, unlike the time constant for sinusoidal chair testing. The reason for this is that an offset of, lets say, 5 deg/sec, will add to responses in one direction and subtract from the other. Because the effect of an offset is nonlinear, and while the Tc can grow to infinity in one direction, but can only go to 0 in the other, it can potentially lead to very long TC in one direction, and somewhat shorter Tc in the other. The net effect is to increase the Time constant for step responses, but to leave sinusoids unchanged. This might also affect PRBS, which is basically a variant of a step. A better way of calculating the time constant is to use ALL of the sinusoidal data, using an iterative curve fit process to a single pole, minimizing the sum of the squares of the error between fit and actual data. This can be easily done in Matlab, using the optimization software, but is beyond the scope of this page. It would be nice if the rotatory chair manufacturers put this into their software. Gain-TC product -- a method of combining all data into a single number. We recently published an article regarding using the step response and sinusoids together to quantify vestibular function (Hain, Cherchi and Perez, 2018). This method provides a simple technique to compute the amount of "total" vestibular function. The fraction remaining of total vestibular function is approximately the Gain-TC product/11.3. Quite a bit more investigation needs to be done to see what GainTc values are in various disease processes. There have been many studies of the VOR in aging, largely concluding that there are modest changes in the VOR gain, TC and phase over age. Baloh and associates reported the gains and time constants of the VOR in a study of 75 “elderly” normal people, averaging 79.6 years old, who were compared to 25 normal younger people, averaging 26.2 years old (Baloh et al., 1993). The gain, Tc respectively for young was 0.63, 15.1, and 0.58, 11.7 for "Elderly". This documents a small decline with age in both gain and Tc. Paige et al (1992) reported on 3 age groups, rotated at 0.025 hz, at 50 deg/sec peak velocity. Clearly, gain gradually declines with age and phase also increases. Somewhat different than this, according to Maes and associates (2014), children's rotatory chair testing show no effect of age (between 4-12 years of age). In their data, for older persons, there is also surprisingly little effect on rotatory chair testing results, although one would expect a downward trend in gain/phase based on pathological studies showing loss of vestibular hair cells and neurons in the ganglia. There is an effect, but it isn't very large. Baloh and associates reported the gains and time constants of the VOR in a study of 75 “elderly” normal people, averaging 79.6 years old, who were compared to 25 normal younger people, averaging 26.2 years old (Baloh et al., 1993). The gain:Tc for young was 0.63:15.1, and 0.58:11.7 for "Elderly". Their data results in a GainTc product of 9.5 for the younger subjects, and 6.8 for the older subjects, from which it can be calculated that the slope of the GainTc/year is -0.051/year. Similarly, Paige (Paige, 1992) reported gain and phase data in 30 “young” (18-44) and 23 “Middle-Aged” (45-69) subjects. The GainTc products for the 0.025Hz -- 50 deg/sec stimulus, similar to our methodology, were computed to be 13.23 and 10.07 for young and middle-aged, respectively, resulting in a slope of -0.12 deg/year. This analysis suggests that the GainTc product declines slowly with age. Ahmed, M. F. M. (2014). "Standardization of Rotatory Chair Velocity Step and Sinusoidal Harmonic Acceleration Tests in Adult Population." Med J Cairo Univ 82(2): 207-213. Baloh, R. W., A. W. Sills, et al. (1979). "Impulsive and sinusoidal rotatory testing: a comparison with results of caloric testing." Laryngoscope 89(4): 646-654. Baloh, R. W., et al. (1993). "The effect of aging on visual-vestibuloocular responses." Exp Brain Res 95(3): 509-516. Hain TC, Cherchi M, Perez-Fernandez N. The Gain-Time Constant product quantifies total vestibular output in bilateral vestibular loss, Frontiers, In press (2018) 3. Maes L, De Kegel A, Van Waelvelde H, Dhooge I. Rotatory and collic vestibular evoked myogenic potential testing in normal-hearing and hearing-impaired children. Ear Hear. 2014 Mar-Apr;35(2):e21-32. doi: 10.1097/AUD.0b013e3182a6ca91. Paige, G. D. (1992). Senescence of human visual-vestibular interactions. 1. Vestibulo-ocular reflex and adaptive plasticity with aging. J Vestib Res, 2(2), 133-151. Su, Y. Y., W. Y. Chiou, et al. (2000). "Computerized rotational vestibular testing in normal subjects." Zhonghua Yi Xue Za Zhi (Taipei) 63(5): 377-383.